The I-11 Draft Tier 1 Environmental Impact Statement and Preliminary Section 4(f) Evaluation (Draft Tier 1 EIS) was made available for public review and comment on April 5, 2019. The comment period closes May 31, 2019. Visit the Public Meetings and Outreach page for more information, including meeting details, repository locations, and how to comment. The public hearings will take place at the locations, dates, and times listed below. The same information will be provided continuously at each public hearing. Attend any time during the hours listed. Monday, 4/29/19 | 5–8 p.m.
Tuesday, 4/30/19 | 4–7 p.m.
Wednesday, 5/1/19 | 5–8 p.m.
Tuesday, 5/7/19 | 4–7 p.m.
Wednesday, 5/8/19 | 3–8 p.m.
Saturday 5/11/19 | 11 a.m.–4 p.m. 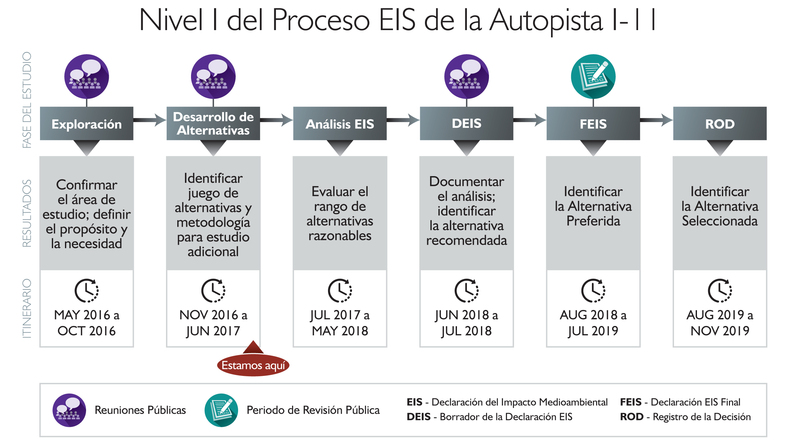 The Tier 1 EIS will take approximately three and a half years to complete (see the timeline below). To initiate the project in 2016, public and agency scoping meetings were held to understand the scope of issues to be addressed during the study. The alternatives development phase of the study incorporated this scoping input to develop a wide range of alternatives, with the goal of narrowing them to a reasonable range of alternatives to be studied further throughout the phases of the study. These alternatives represent both public and agency input, and meet the corridor’s Purpose and Need. The reasonable range of alternatives evaluated in the Tier 1 EIS includes the No-Build Alternative (the do-nothing option). The EIS analysis phase is a detailed analysis of potential social, economic and natural environmental impacts of the proposed corridor options. The Draft Tier 1 EIS documents this analysis process, identifies a Recommended Alternative, and is being presented to the public for review and comment. Based on the comments received, a Final Tier 1 EIS report will be prepared, outlining a Preferred Alternative for I-11. After public review of the Final Tier 1 EIS, FHWA will issue a Record of Decision (ROD) that indicates a Selected Alternative for I-11. The No-Build Alternative could be chosen as the Selected Alternative and the final decision in this Tier 1 process. If the ROD selects a Build Corridor Alternative, a phased implementation plan would be developed for it as part of the Tier 1 EIS process. A phased implementation plan includes smaller segments of a corridor alternative that may advance as separate, independent projects.